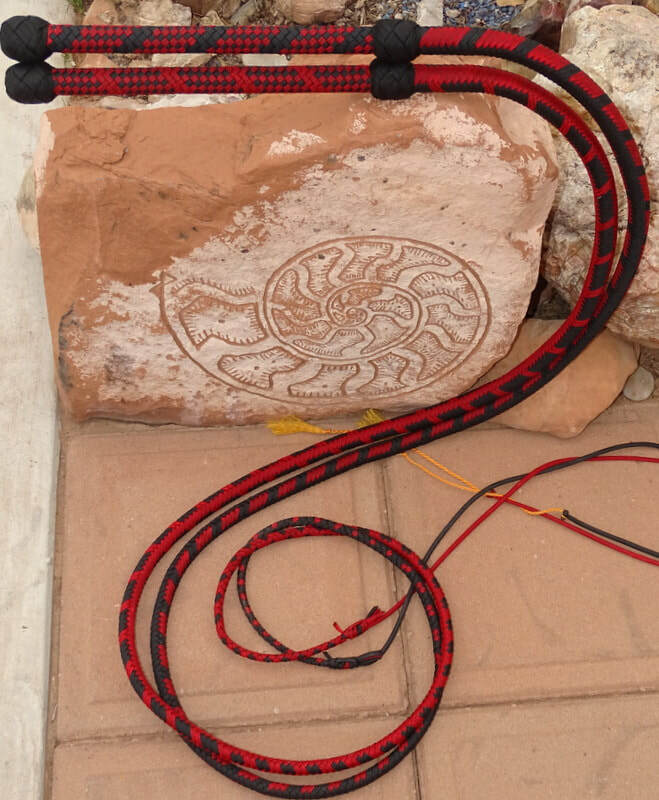 Nylon Bullwhips, Nylon Martial Arts Whips and Nylon Performance Whips handcrafted with care by Bobbi HolyOak. My nylon whips are great for Performers, Sport crackers, Martial arts, Self defense and those looking to take up a new hobby. All of my whips are built custom with care and attention to detail. I specialize in Tibetan Wave™ and Sonic Alignment™ whips but am not limited to those. I'm happy to work with you to achieve your exact needs. 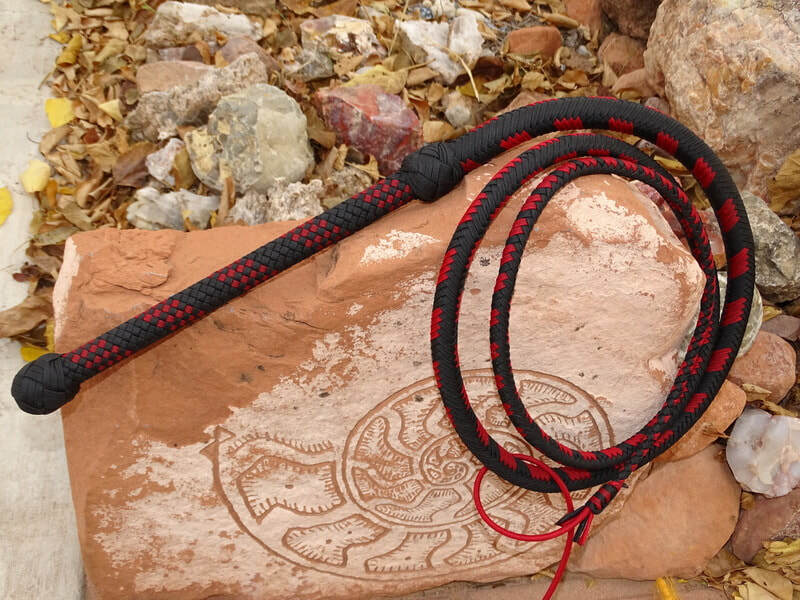 HolyOak whips are built using 550 & 650 nylon paracord, which does not mildew or rot. 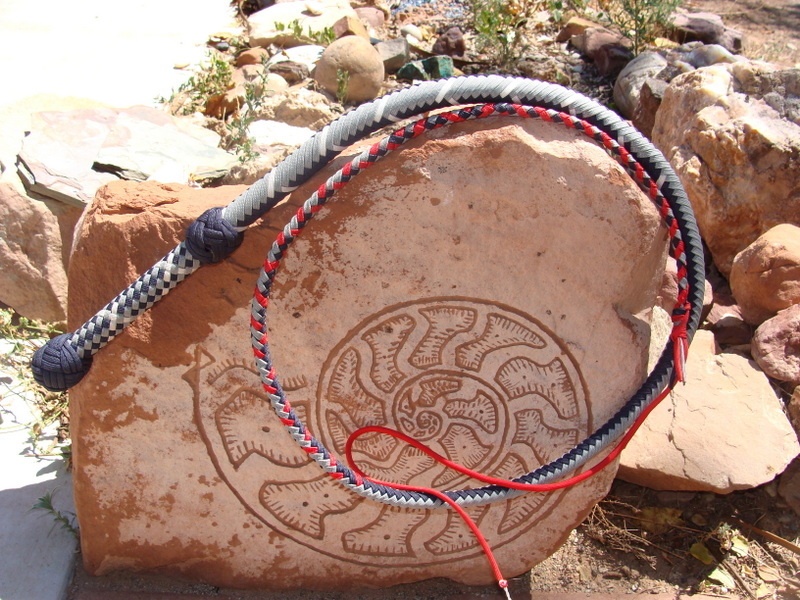 All whips have at least one braided belly as well as traditional bolsters. I never use tape in the construction of my bolsters because every whip is waxed using the submersion technique. Handle bases are made from steel rod or oak, depending on your weight preference. When you think of a whip the image of cowboys and Indiana Jones comes to mind. Traditionally, leather is what we think of. Personally, I started with a beautiful kangaroo whip made by Peter Jack and still have a deep love affair with leather. However, leather does have some limits and drawbacks. It can't get even the slightest bit wet or the whip becomes uncontrollable and then will need quite a bit of drying and waxing to keep it from getting stiff and cracking. It isn't a great idea to crack your leather whip on hard surfaces like concrete, pavement or gravel because it will chew up the knot that attaches the fall, causing the need for repair. Then there is the price... leather isn't going to be in everybody's budget. Nylon whips are a great alternative. Gone are the days when nylon whips were thick, bulky and hard to crack. Today they are streamlined, colorful works of art that anyone would be proud to own. There is no need to worry about the weather or finding a patch of grass to use your nylon whip. 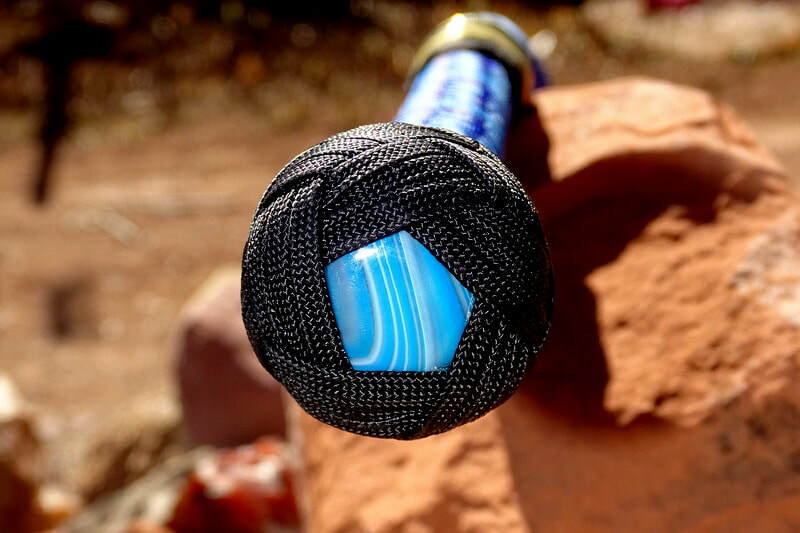 HolyOak whips are almost indestructible and require very minimal maintenance. Want to crack your whip in a thunder storm, a snow drift, or on a sand dune? No problem! Go have fun. 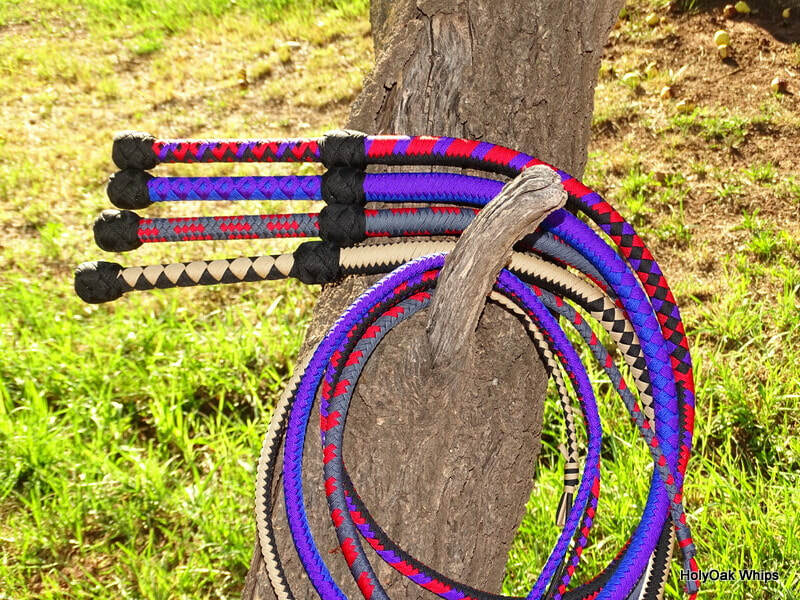 If you're new to whip cracking or have a child who would like to give it a try, and you're not quite sure you want to spend the money one a quality roo whip, then nylon is going to be a good choice for you. I love my whips and take a lot of pride in each one. I want you to love them too. I do have a formula that I use to make them but I am always tweaking things to improve the whips. I welcome feedback and ideas. Check out the site and email me or use the contact form if you have any questions. Thanks for visiting HolyOak Whips.